Dr Lovemore has just the prescription for ladies with lonely hearts - sleaziness. Click here to play! Well, he wouldn't put it that way, but one thing is guaranteed - you will! You have to give it to Dr Lovemore, though, he is persistent and does what he can to bring the romance. If a number plate that says Wild doesn't do it for you, then you're probably a normal person. Don't think that'll stop Dr Lovemore, though. He's willing to try all the fruits of love to win your heart, with strawberries, oranges, bananas, cherries, and the most romantic of all, the Kiwi fruit. With such fine tastes, how could anyone resist Dr Lovemore in his pink and white suit? Easily, that's how! He's not going to give up yet. If a bouquet of roses, perfume, champagne and a tacky male symbol/female symbol intertwined piece of bling don't win you over, then Dr Lovemore still has his pants. Yes, Dr Lovemore will flash you his boxers, as predictably covered in love hearts as he will be predictably rejected by even the least discerning of his love interests. Nevertheless, you have to give Dr Lovemore credit for his incredible tenacity, even in the face of crippling and absolute rejection. 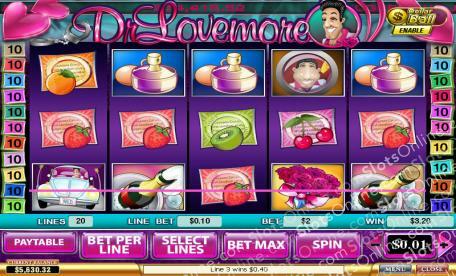 Play the Dr Lovemore slots today to have fun witnessing the horrifying farce that is his love life. The game even simulates how Dr Lovemore's love interests will look though the peep hole every time they hear a knock on the door, all to make sure it's not Dr Lovemore. Peep hole symbols payout prize money on the total bet. 2 symbols pay equal to the bet, 3 symbols pay 5 times the total bet, 4 symbols pay 25 times the bet, and 5 symbols payout 250 time the total bet. Wild number plate symbols may substitute for any symbol except a scatter or bonus symbol. They can also payout large prize for more wild symbols. 2 pay out 10 times the payline bet, 3 payout 100 times, 4 payout 1000 times and 5 wild symbols payout 10000 times the payline bet.